Other Countries: Italy; Germany; POW in Poland; Japan; Korea; Vietnam. Combat medical support of infantry divisions. Advisory to Korean and S. Vietnamese Armies. Intelligence/interrogation of N. Korean troops and also Japanese POW's returning from Russia and Manchuria. Basic medical training, medical doctrine and training literature, medical material research and development. Army Medical Department Recognition Medallion for Faithful Service. Bathed in steel helmets with cold water, or didn't bathe at all. 'C' and 'K' rations. Cooked and ate at every opportunity. Always hungry when POW, lost 40 lbs before liberation. Not much entertainment in combat. Looked for sexual outlets when single - somewhat curtailed after marriage. Humorous: Caught in a foxhole at sundown between Bruyeres and Biffontaine, France after evacuating the owner of the hole. So had to stay in it all night. Had to urinate in the middle of the night. But couldn't get up as Germans were infiltrating our lines - so urinated in a spare condom until it was full, tied a knot to keep it from spilling and gingerly started to lift the full load out of the foxhole while lying flat on my back. Halfway up, the condom got caught on a snag and busted - spilled all over my whole body. Had to stay in the mud rest of the night and live in the soaked clothes for days as no time to change. Rescue of Lost Battalion. Captured 2 days later. Wore the same uniform for days - small wonder those around me gave me a wide berth - avoided me like a plague. Even German interrogators made it brief as possible. This is the first time that I have ever related this incident. In combat, peace and quiet, regular meals. Most important thing, personally, to come from military experience? Most important: Being loyal to country, stay healthy, do the best job possible with available resources, both materiel and personnel. Treat people as you would like to be treated. Take care of personnel entrusted to you for supervision and they will take care of you in time of need. Do not bring discredit to family and the unit to which you are responsible. Stay clean mentally, physically and spiritually. and 'CYA' - Cover your 'tracks'. My military service is an open book - Can't hold anything back. Received battlefield commission as one of four. First in 442nd Sept. '44 (Florence, Italy) and converted it to a regular Army commission in June 1946. 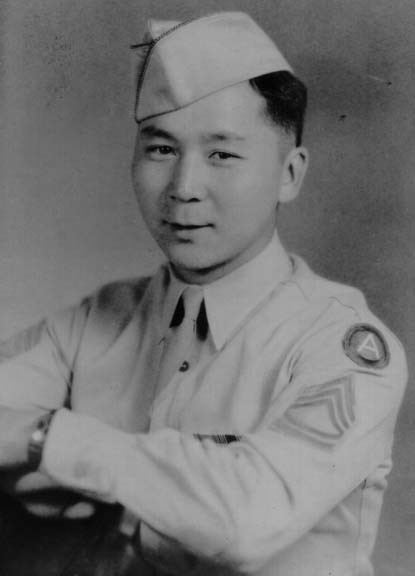 No other Japanese American names on the roster of regular Army officer at that time. Many Niseis integrated in RA at subsequent increments when RA officer roster was increased from 25,000 to 50,000. If there are any RA AJA officers prior to June 1946, I will take my hat off to him. Please let me know if you locate one. As a high school drop-out (nearly) I received both undergraduate and a graduate degree while still in the Army - attending night - week end schools and during extended leave periods. The Army took care of me. I went to 17 colleges and universities to collect enough credits for a total of 5 degrees. Didn't quite make PhD.